This page contains pictures and information about Wasp-mimicking Rhiniin Flies that we found in the Brisbane area, Queensland, Australia. The fly has the thorax in black colour with blue-green and coppery metallic reflections, and with dense small bristle-dots. Abdomen is black-banded on yellow colours mimicking bees or wasps. There is the apical spot on wings. 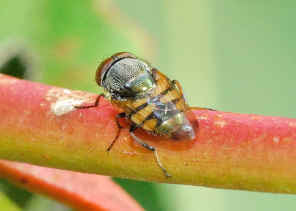 Legs are yellowish-brown in colours. 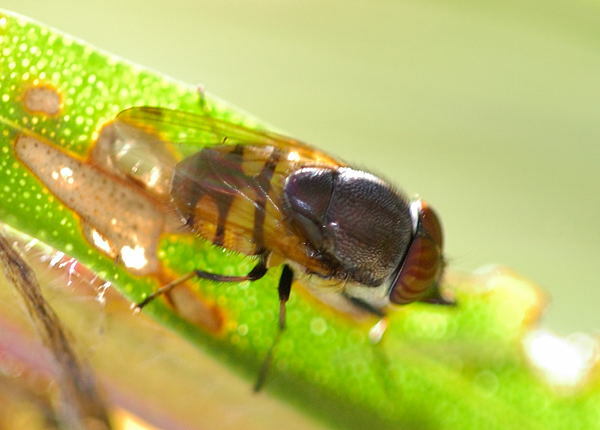 Most wasp/bee-mimicking flies we found are Hover Flies in the family SYRPHIDAE, initially we thought this fly was a Drone Fly. Later we found out that, it is a blowfly in subfamily Rhiniinae.